The eyes of the world is the Philippines as Pope Francis will visit the Philippines after a short visit in Sri Lanka. This is the second Asian country that Pope Francis will be visiting bearing the message of Mercy and Compassion. This message is especially given for the poor. Amidst the advances that the world is experiencing, there are things that should not be forgotten; there are people who need the help of each one of us - the poor. The 5-day visit of the Pope is scheduled with this photo at the left side. January 15 is the arrival of the Pope in the country then he will proceed to the Official Residence near Quirino Avenue, Manila. On January 16, the Pope will have a courtesy visit at the Malacanan Palace in Manila. Since the Pope is not just a religious leader from Vatican, but he is also the head of state of Rome, the Philippines government will conduct a welcome ceremony for the Pope with a 21-gun salute. After the courtesy visit, the Pope will proceed to the Manila Cathedral in Intramuros, Manila to celebrate the Holy Mass. Then, he will proceed to SM MOA Arena for the meeting of families - there are pre-registered families already to meet the Pope. Then, back to the Official Residence. 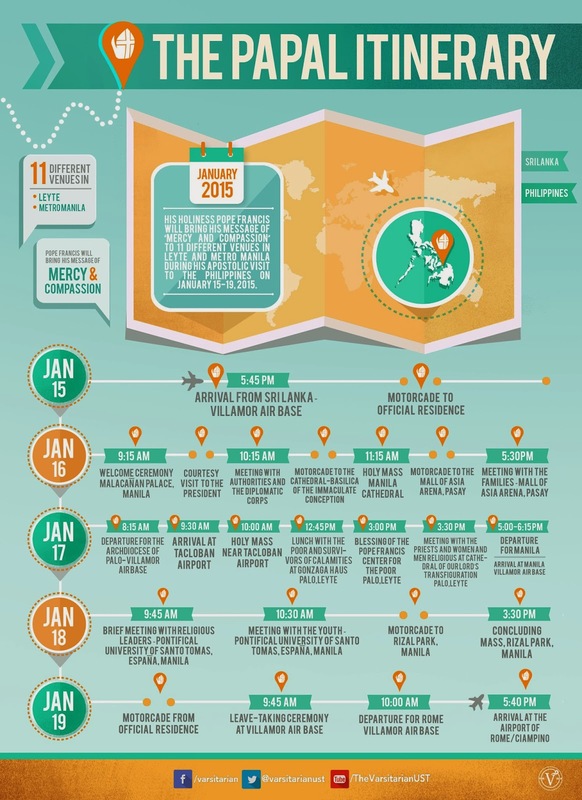 On January 17, it is the schedule going to Tacloban. In Tacloban City is where the Pope will celebrate the Holy Mass and meet some poor and survivors brought by the typhoon Haiyan and the earthquake of Bohol. Then, the Pope will bless the Center for the Poor in Palo, Leyte and he will meet also some religious men and women at the Cathedral of Transfiguration. After the Pope's activities in Leyte, he will go back to Manila and back to the Official Residence. On January 18, the Pope will proceed to the Pontifical University of Santo Tomas. It is where he will meet some religious leaders and have a talk with the youth. After the event at the Pontifical University of Santo Tomas, the Pope will have a motorcade going to the Rizal Park, Manila. It is where he will celebrate a concluding mass with expected more than 5 million people to attend. On January 19, it is the scheduled departure of the Pope going back to Rome. The Papal Visit in the Philippines serves as a light to everyone that there is hope in all the circumstances that the country is facing, and it leaves the message of MERCY and COMPASSION. Enjoy the visit at ten7avenue.com!